A Russian Tilts at Graft (It Could Be a Quixotic Task). (Foreign Desk) Sabrina Tavernise. Not long after Boris N. Yeltsin chose him as an adviser, Georgi A. Satarov decided to conduct an experiment. He invited top officials from Russia's police force, its Federal Security Service, and prosecutor's office to the Kremlin. Then he proposed that the officials plant bribe-givers in their ranks. The idea was to identify sources of corruption in government. It was based on the F.B.I's Abscam campaign of the 1970's that entrapped members of Congress who took bribes from agents posing as Arab businessmen. The ruse never got off the ground. But it would be a recurring theme for Mr. Satarov, who went on to spend five years inside the Kremlin during some of the most tumultuous times in Russia's transition to capitalism. Fighting corruption would eventually turn into his life's work. Mr. Satarov, tall and stooped with a Santa Claus smile, last year published two groundbreaking studies that illustrated, in eye-popping detail, exactly how much Russians pay in bribes. His research institute, Information for Democracy, surveyed 7,504 Russians to piece together what was the first comprehensive picture of Russian graft. It was not pretty. The researchers estimated that Russian citizens pay about $3 billion in bribes annually -- about half of what they pay in income tax. Business owners, meanwhile, were found to fork over a whopping $33 billion to keep things running smoothly, a sum just less than half of all of last year's federal budget revenues. Traffic police officers rake in $368 million, beaten only by education employees, who take $449 million. The list goes on. That Russia is corrupt surprised no one. Russians had become blase about the problem after a decade-long economic roller coaster ride. Mr. Satarov's numbers were important, instead, because they showed the sheer magnitude of the problem and helped people realize how much of a drag it was on the economy. Corruption is not, as many here will claim, an inextricable part of the mysterious Russian soul, but a curable sickness, Mr. Satarov says. That attitude and his lack of cynicism sets him apart from the Russian elite, who roll their eyes at the naivete of anticorruption campaigns. 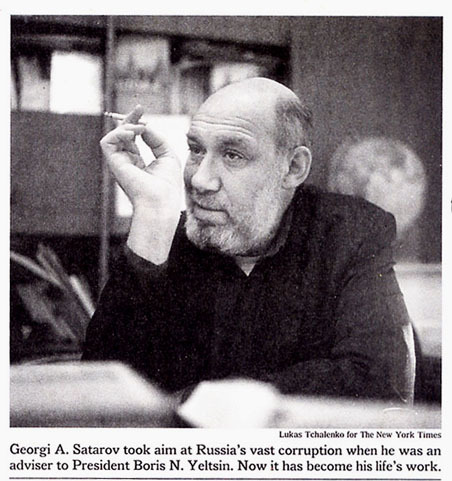 Mr. Satarov's experience as an insider gave him unique view of the problem of Russian corruption. The Kremlin simmered with scandals in the giddy 1990's. Privatization gave away valuable assets in cozy deals. Bureaucrats were profiteering from oil sales abroad at hundreds of times the domestic price and using the National Sports Fund to import luxury goods tax free. Mr. Satarov, now 55, was one of a group of intellectuals who were swept into government in the romantic rush that followed the fall of the Soviet Union. He came from academics. As a mathematician in the 1980's, Mr. Satarov bided his time making models of voting patterns in the American Senate. Studying the Duma, or Soviet Parliament, was senseless -- it always voted unanimously. Life got interesting in the late 1980's. The Soviet Parliament began to vote its mind. Then, in the topsy-turvy landscape of the new Russia, Mr. Satarov leapt from a research institute into the halls of the Kremlin. He was invited by Mr. Yeltsin himself, who wanted a wise, intellectual counterbalance to his team of career bureaucrats. If later his work on corruption took the form of mathematical formulas, it began in the real world. He fought for the dismissal of a bribe-taking regional mayor. (He won.) He disclosed a scheme used by a political party to skim money from the state budget. But those battles were short asides to his main tasks of advising Mr. Yeltsin and writing speeches for him. He rejected the only bribe he was ever offered. But on his Kremlin salary of $1,000 a month, far more than the Russian average, that was not hard. Still, he is not rich. He lives in a one-bedroom apartment in Moscow with his wife. He works on a computer with a hard drive that drones loudly, indicating imminent failure. A handwritten sign taped to his photocopier warns potential users that the machine is broken. He left government in 1997, when, in his words, being an intellectual and remaining a bureaucrat were mutually exclusive. The businessmen had risen to power and were bossing state officials and, in some cases, making government policy. By then, the government had hardened, grown cynical, and lost the idealism of the early 1990's. Corruption was flourishing. He was intrigued by the roots of corruption. In Russia, unlike in the West, personal relations transcended professional ones. The same threads that tied people together bound the bribe taker to the giver. Corruption was not just a simple crime. It was part of the fabric of Russian society. It has been for centuries. Under the czars it was the stuff of literature and folklore. Then in Soviet times, government officials treated property that supposedly belonged to the people as if it was their own. But by most accounts, bureaucrats began to grow very rich only after Communism collapsed, when partial economic liberalization made certain state posts extremely lucrative. ''Our list of the 50 most influential Russian businessmen includes two government ministers,'' said Mr. Satarov. At least a third of parliamentary deputies have their own businesses. Government posts, including -- some reports say -- minister and even deputy prime minister, have been bought. Russia's economy plunged into deep recession after the fall of the Soviet Union. In the vacuum that ensued, salaries shrank to a pittance. In the early days of capitalism, furthermore, the line between corruption and new thinking was blurred. Everyone was a state employee, and almost any activity could have qualified as corruption. Low state wages are still a problem. Mr. Satarov has tried to help bureaucrats tell their embarrassing secrets in public. He published a study late last year showing that most state workers would be happy with salaries of $500 to $800 a month -- about quadruple what they make now. In some cases, bribes have so corrupted institutions that they have virtually disintegrated. Take Russia's public education system. Teachers and administrators, some of the lowest paid people in the work force, were sustained by bribes from students. But the bribery spread. Now students can buy good grades.